Welcome to the Roatan Tec Center on the beautiful Bay Island of Roatán, Honduras, Central America! Whether you are a beginner technical diver looking to discover what diving has to offer you, or an experienced technical diver eager to take on the challenge of Trimix diving, we have something for everyone. Please be aware that we are a very popular dive shop in West End and tend to sell out our dives several days in advance. While walk-in customers are certainly welcome, reservations are strongly encouraged. Sidemount diving is becoming very popular with divers from all experience levels. One of Roatan Tec Center's founders, Monty Graham, is the only facility on Roatan teaching and diving Sidemount. For the training we use top of the line XDeep Stealth 2.0 harnesses and DiveRite regulators. The Roatan Tec Team will help you expand your dive skills by training you with the necessary fin techniques, streamlining your sidemount equipment, and learning primary and secondary tie offs in the two day cavern course. Become a gas blender and fully understand the concepts behind the making of exotic nitrox and trimix gases. Are you Tec certified already? 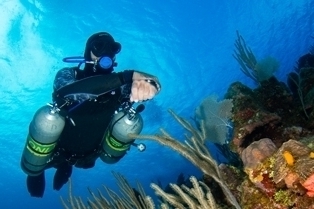 Go the extra mile and sign up for a trimix class to take you to the extreme depths of the mesoamerican reef. Click on the link and read our excellent reviews from our dive customers.